The World's # 1 Male Deodorant Axe, presents a range of deodorant bodysprays for men. Designed by the world's leading perfumers, the Axe Recharge range of deodorant bodysprays not only helps you smell good but also keeps you fresh, clean and energised. 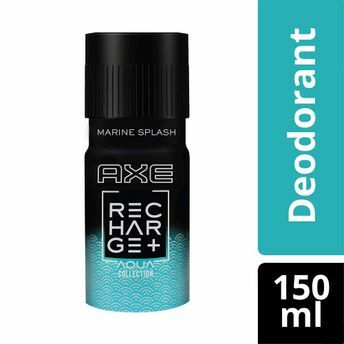 Axe Recharge Deodorant Bodysprays have energy-filled fragrances that are boosted by heat. From the moment the spray touches your skin to multiple hot moments'throughout the day, Axe Recharge Deos will give you a burst of freshness when you need it the most. With a one press spray can'it reaches all over your body. Spray it on your underarms, neck, chest and back and feel the freshness in every pore of your body.Feel the cool splash of the sea with Axe Recharge Marine Splash Deodorant Bodyspray. Fresh, citrus top notes are combined with a masculine, woody base to create this fresh and long-lasting fragrance for men. The aqua-citrus aroma of this deodorant bodyspray is reminiscent of a beautiful day on the beach. Even in harsh temperatures, it will energise you and keep you smelling great all day. The bottle is extremely lightweight which makes it travel friendly. It is not just an ideal gift for yourself but for your loved ones too. This deodorant bodyspray is safe on skin and is suitable for everyday use.